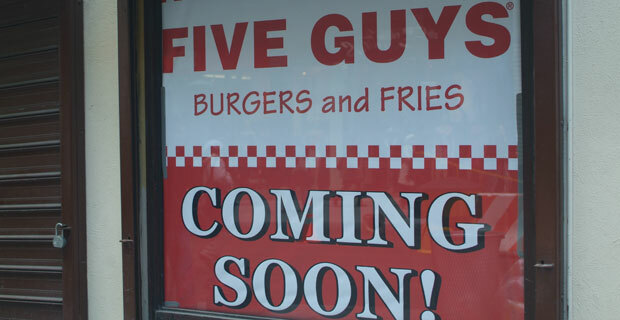 Rumblings of a Shake Shack, but Five Guys will be here first. With the closing of Applebee’s this year, there has been a lot of speculation as to what new businesses will take over the newly and increasingly vacated spaces in the shadow of the new Goldman Sachs building. Many have gone out on a limb to say that Danny Meyer of Shake Shack fame is setting his eyes on a downtown location. This would be great if confirmation of the move wasn’t veiled in so much secrecy. NYÂ Eater has had it’s hand on the pulse of this alleged burger movement Downtown. Not to be overdone with the burgers, BLT is planning on opening their own Bar and Grill within The W this summer as well. With all the hoopla surrounding the burger joint’s new arrival — I’m wondering why no one is touting another reputable burger institution, also setting it’s roots by our neighborhood. 1. Tourists + Lines for burgers = Hell. Can you imagine the ruckus that the lines for Shake Shack would be like? For the fact that Shake Shack’s official website highlights waiting on line as part of the burger experience is sort of off putting. Why not show juicy burgers first?! 2. Five Guys has better fries. Hands down. Plus the cost of a burger and fries from Five Guys would be half as much as a burger at PJ Clarke’s which requires us to BYOF* or else be left with a lonely hamburger. The topic choices at Five Guys is way more impressive than Shake Shack. Hey, in this crazy economy — if a burger joint is going to make you wait for a burger, being on a line won’t be the the only reward at Five Guys. Free peanuts for all who can ingest them. To be fair — Shake Shack has ridiculously good custard, not sure I would welcome the lines, traffic and hoopla into our neighborhood for it. I was always glad to know that craziness existed far away from home. If the rumor becomes fact, we’ll just have to wait and see what the net effect will be. Ever try Burger Shoppe on Water St near Broad? I think it’s very Shacklike, and while popular, it’s not overly crowded most of the time.